Director Luca Guadagnino's interpretation of Dario Argento's 1977 movie of the same name stars Dakota Johnson as Susie Bannion, an American dancer accepted into a prestigious German academy. The school, run by director Madame Blanc (Tilda Swinton), houses sinister secrets that mysteriously drive away two of the program's dancers, Patricia (Chloe Grace Moretz) and Olga (Elena Fokina). As psychotherapist Dr. Jozef Klemperer and fellow dancer Sara (Mia Goth) probe into the academy's evils, Susie gives herself over to its dark powers. Music by Radiohead's Thom Yorke. 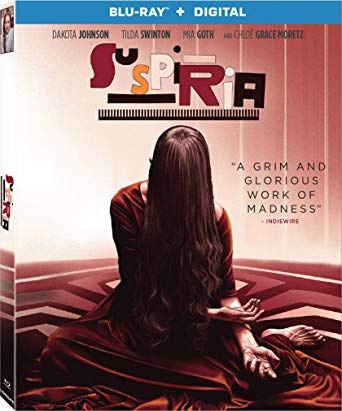 This blu-ray disc also contains The Making of Suspiria and other bonus features.